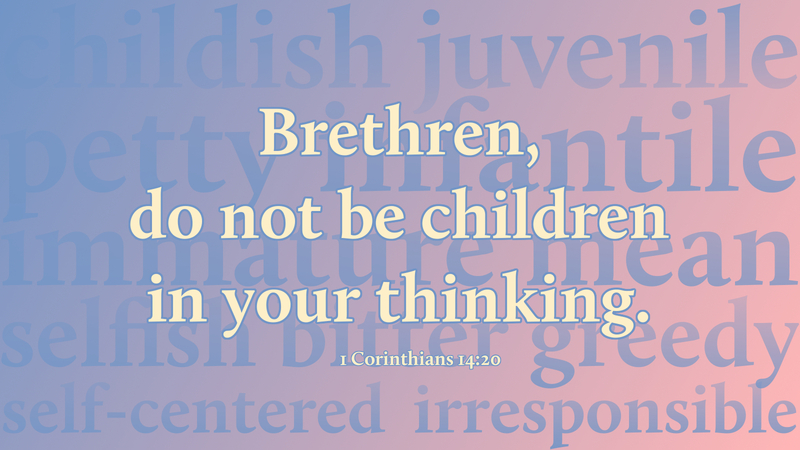 “Brethren, do not be children in your thinking; be babes in evil, but in thinking be mature” (1 Cor 14:20). There is much to be said for maturity, isn’t there? Once upon a time, we looked forward to becoming mature, responsible, wise adults. Today, not so much. It seems that many young adults cling to adolescent immaturity, refusing to grow up, refusing to accept adult responsibility. Paul is very concerned about the spiritual immaturity he sees in the Corinthian congregation, where there is enmity, spite, boasting and pridefulness. He exhorts his readers to not be children in their thinking. Yes, be babes in evil, but in thinking, be mature. It would seem helpful for us to again focus on being mature, responsible Christians—thinking not in childish ways but with the wisdom that Christ Jesus taught us. And what is mature thinking? Not being selfish, greedy, or self-centered; putting the needs of others before your own needs. As Jesus teaches in the Sermon on the Mount, “do unto others as you would have them do unto you” (Matt 7:12). This is how we are to live with mature thinking. And should we say a word or two about “being babes in evil”? What exactly does Paul mean by that? He means we are not to develop our ability for evil. Granted, we pick up enough of that as we grow through the years. But some seem to pride themselves on how they are able to do evil in such creative, ungodly ways. Many believe that criminals are sent to prison to be rehabilitated. Often they become even more knowledgeable and proficient at their criminal behavior. They become mature in their evil. Sadly, evil will always be with us. But among Christians, we are to give evil no opening. We are not to entertain evil thoughts and desires. Rather, we are to be spiritually mature in our thinking and our acting! Prayer: Lord God, send your Spirit that we may be babes in evil, but spiritually mature in our thinking and doing; through Christ our Lord. Amen.